St Thomas H.O.P.E. 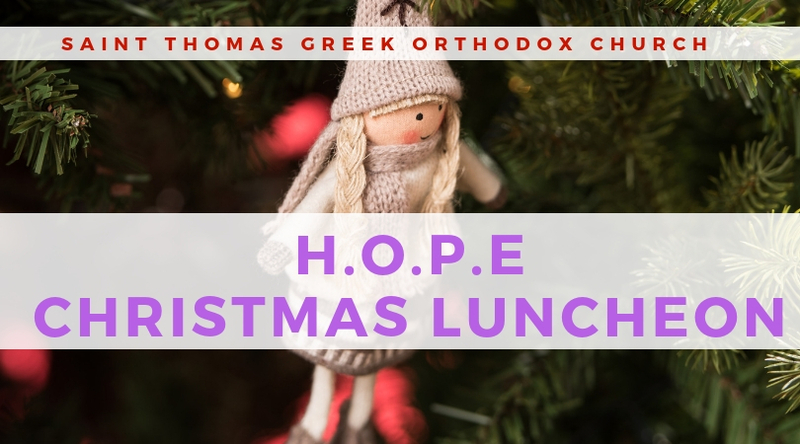 cordially invites ALL St Thomas families to our Annual Christmas Luncheon after the Divine Liturgy and Orthodox Faith Sunday School on Sunday, December 9th 2018. Together, with all Saint Thomas Youth Ministries, please join us for our Christmas tree lighting ceremony, food, and fellowship! Christmas Carol Karaoke and craft for the kids!! Cost is $7 per person. For questions or RSVP, contact saintthomashope@gmail.com. Have a Blessed Advent Season!